I can’t believe as much as I am into cooking and living in the kitchen (or so it feels like), I don’t have a category for food and/or recipes. Well, this post will take care of that. It occurred to me when I did the post on being frugal, I left off one of my favorite ways to save at the grocery store: the bulk bins! Not all stores have bulk bins, but those that do, it’s a great cost saver. Here’s why bulk bins are in. You buy what you’ll use. 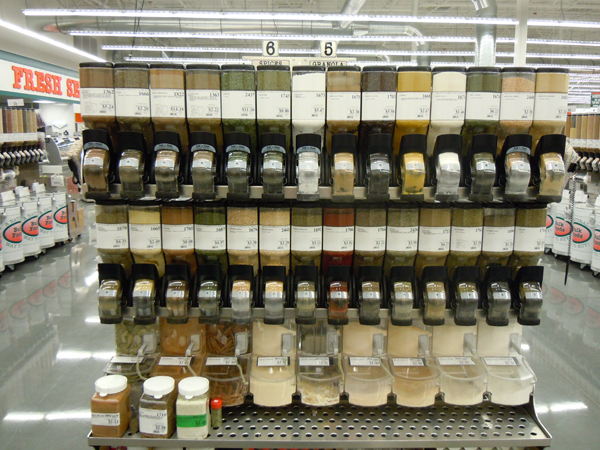 The picture shows spices and herbs in bulk containers. Most recipes call for a couple teaspoons or tablespoons at a time. Why have so much left over? Not necessary. You don’t buy a new jar/bottle each time. If you cook at all, I’m sure you have a bottle for parsley, dill, onion powder, etc. already at home. I bought dill last week from the bulk bin. When I got it home, I put it in my existing dill jar. Cost: Buy a McCormick’s brand bottle of dill and you’ll easily spend $4.00+ for the same thing. Even buying store brand will cost you over $2.00. No sense in paying for advertising and jar costs. I think I put in 5 spoonfuls and it cost me under $0.50. Freshness: Why store a spice by the bag or jar for months, esp. one you don’t use much. Buy a bit here and there. The store is constantly cycling out product as people use them. Specialty items: One item I need to use on occasion is Xanthan Gum. It’s used in gluten-free cooking. Now, there are premade flour blends that have the Xanthan gum in them. It’s really quite convenient. My only complaint is for 14 oz. of the flour blend, I have to pay $11.00. 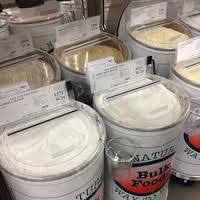 Now, when I use the bulk bins for a gluten-free flour mixture, I can also pick up a couple of tablespoons of the Xanthan Gum. I spend a lot less for the same type of flour and I combine them myself. This specialty item, the Xanthan Gum, is over $18.00 per pound. I don’t need to spend all of that at once. I’d much rather spend $3.00 than $18.00 for the same item and use what I need. Variety: Perhaps you need a cup of this and a half a cup of that. Did you really want to pay for two separate items, pre-packaged? No? Then head to the bins and gather up what you need. From coffee to spices, to dog treats, to flours and mixes, bulk bins are becoming a popular store attraction. People are learning to eat healthier using the items from the bins and cooking at home (another cost saver over eating out). Next time you’re out, check out the bins you typically walk past. See what all the fuss is about. I bet you’ll be glad you did.